There are few pieces of swim equipment that seem are more synonymous with swimming than a kickboard. Perhaps goggles. But kickboards have actually been around longer, about 20 years longer, as they were first introduced as a swim aid in the late 1940s. So what do kickboards accomplish, and why do swimmers like them? Technically, kickboards allow swimmers to isolate and focus on their kick, without having to worry about their arms or breathing. But realistically, swimmers like kickboards because it makes kicking much faster by significantly reducing friction (by elevating the upper body and introducing a smooth surface as the interface with the water), allowing the swimmer to breathe whenever they want, and allowing them to chat with others. So, of course they like it! So what do I have against kickboards? Well, for the last 4 years I’ve firmly believed that they promote the wrong body alignment when kicking hard. And I believe this carries over into a bad alignment when swimming Free and Fly hard. On the other hand, I think a kickboard is actually good for breaststroke kick, but we aren’t using it properly. A swimmer’s body should be roughly in a straight line in order to minimize drag, or water resistance. For various reasons this straight line may angled very slightly upward, but the concept is still that the body should be relatively straight. This drawing is a rough approximation of what it should look like. I’ve superimposed three spots on the body to highlight the body alignment. These spots are the base of the neck, middle of the hips, and middle of the knees. Now, as any swimmer or coach knows, kicking with a board involves holding the board with outstretched arms, the head out of the water, and the upper body much higher than in a normal swimming position. The drawing below roughly shows this body position. You can see from our superimposed spots that there is a definite bent body alignment when kicking with a board. Check this out for yourself next time you watch swimmers kick with a kickboard. It’s pretty obvious. So here’s the problem. When all or almost all hard kicking is done with a kickboard, the body’s muscles will associate hard kicking with this bent body alignment. This means that during any swimming with hard kicking, the body will want to bend away from the straight line, putting the feet in a higher position in the water. Notice that even a small bend in the body will position the feet much higher, resulting in kicking more air and less water. If you doubt this, ask yourself why swimmers who are sprinting often start producing far more splashing with their kick. And yet splashy kicking, i.e. kicking air, doesn’t help them at all. So, the question is why is this happening? I think its because of the kickboards. I’ve only addressed the freestyle kick so far. 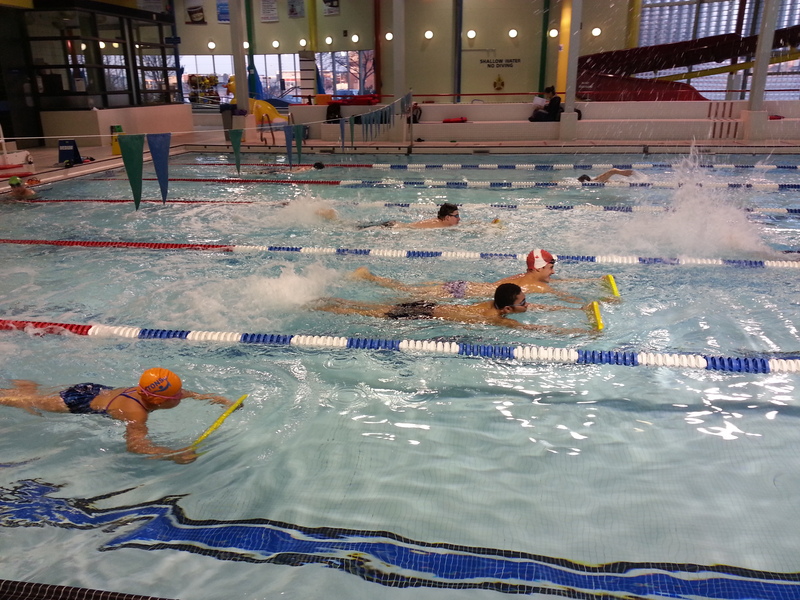 Butterfly, being a short axis stroke, is far more complicated as the hips drive up and down during the stroke. 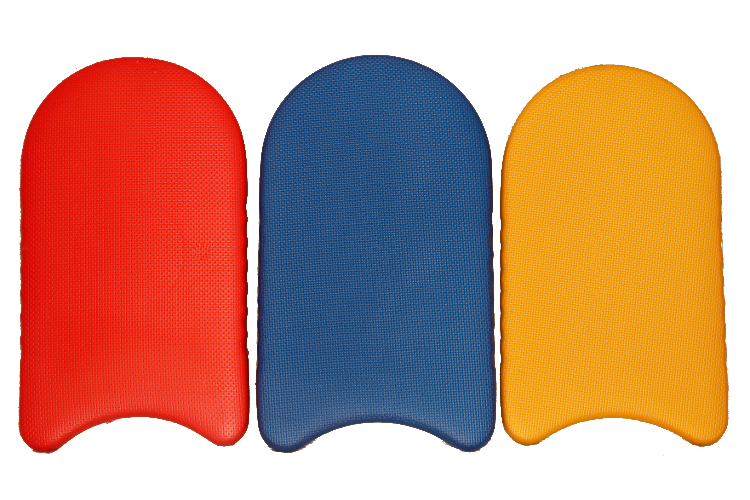 In general, using a kickboard which places the upper body into a fixed, high position is a very poor proxy for the highly fluid butterfly body position. To me, breaststroke kicking with a board makes perfect sense, as the elevated upper body position actually mimics the natural high body position prior to a kick. But practically every swimmer I’ve seen do breaststroke kick with a board does it all wrong. Most kickers will start the kick with their body in the normal slightly elevated position, and then allow the kick to move the upper body slightly higher up onto the kickboard. This is exactly the opposite of a normal breaststroke motion. In order to properly mimic breaststroke body position, the upper body should be high at the start of the kick, and then shoot down lower (simulating the arms recovering forward) by the end of the kick. Here’s what that should look like. Social kicks are just long, easy kicks where kids can kick together, chat and basically relax while doing light exericse. They are very useful on an infrequent basis, especially after a weekend meet. Kickboards are necessary for this. I just don’t do it very often, and I don’t have them kick hard. I don’t want their body to associate this bad alignment with any type of racing. There is one other time when we use boards for Free and Fly kicking. And my swimmers are not really fond of it. If the swimmers hold the board fully submerged and turned to present the most resistance, then kicking becomes very hard. This can be good for developing power. And it can also be useful for training for long course. A single 25m length of kicking like this can involve as many kicks as they would take to do 50m of normal kicking. This makes it an ideal training aid to help the swimmers manage to conversion to the long course season. Notice also that since the swimmers aren’t resting on the board, the body position is a little more natural. Swimmers certainly don’t thank me when I take away their kickboards, but I’m convinced that the traditional way we use kickboards is counterproductive to effective kicking in a race. I’d love to hear from you about what you think of kickboards. Next Post Should Swim Practices be Open or Closed to Spectators? Hi Scott, I hadn’t seen The Brick until you mentioned it, and so I have no practical experience with it. I like the general idea of a kickboard that provides no flotation. It will certainly provide a better body position than the regular kickboards. To me the key is ensuring that kicking with power with or without a board should involve the same body position. This is better, but still not natural. For instance, 2 arms in front of the prone body isn’t natural. That body position never exists in swimming (you are usually rotated in Free, and have a non-flat body in Fly). And regular boards are better for Breast as they provide the buoyancy that simulates the start of the BR kick. Also, when you breathe with a board, you almost inevitably breathe forward. Again, not natural. However, as I said, I have no experience with it. So in practice, it may be fantastic. If anyone out there has experience with The Brick, I’m quite happy to hear about it. I DO NOT LIKE MY SWIMMERS USING KICKBOARDS!!!! I agree with the misjudgment for body alignment – especially young swimmers. They do not learn as quickly where their balance is when using what I call “artificial aids” in swimming. I have a great deal of success with all my swimmers and you will not see kickboards in any of my practices.